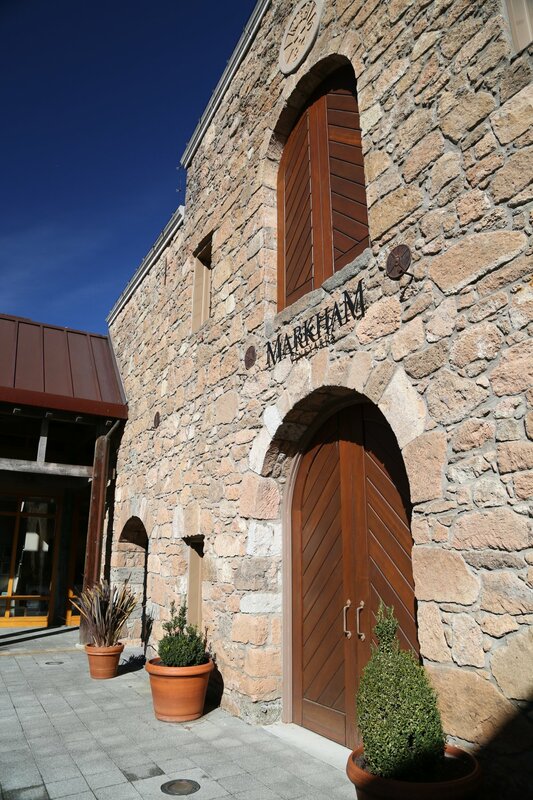 Markham Vineyards was founded in 1874 as Laurent Winery, named after founder Jean Laurent who immigrated to California from Bordeaux in 1852, seeking his fortunes in the gold mines of the Sierra Nevada foothills. 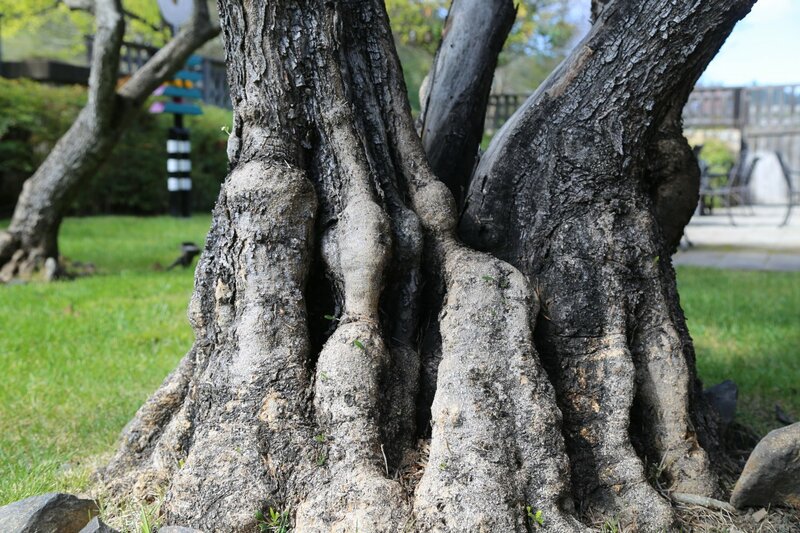 However, he was several years too late to the height of the mining action and rather ended up going into agriculture and settling in the Napa Valley. He is among the earliest of the French winemakers to settle in Napa and we were told the first to use French Oak barrels at a winery in the Napa Valley (the use of large redwood tanks were very common for decades). Laurent released his first vintage in 1874, initially built a wooden winery and then replaced that 5 years later with a stone winery (which is still within the primary footprint of the existing winery and barrel rooms). 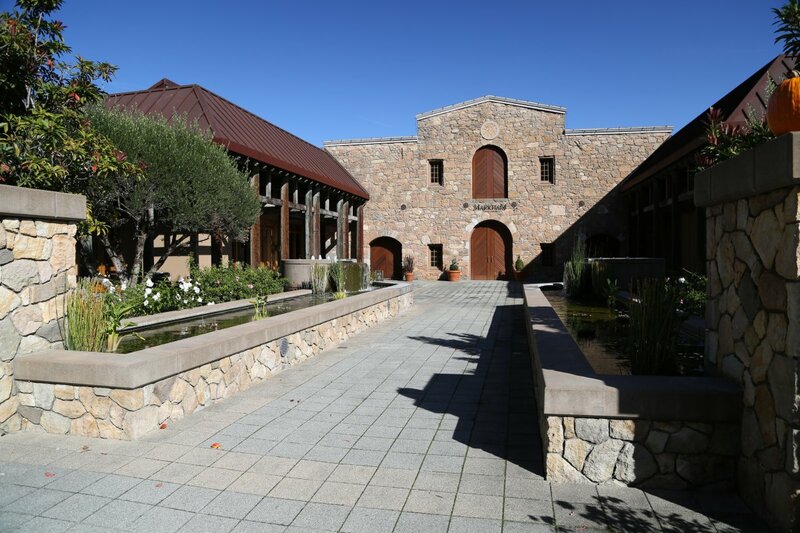 The winery building is one of the oldest winery buildings in all of the Napa Valley although wine was not made every year since the first vintage – as the winery was shuttered during Prohibition. 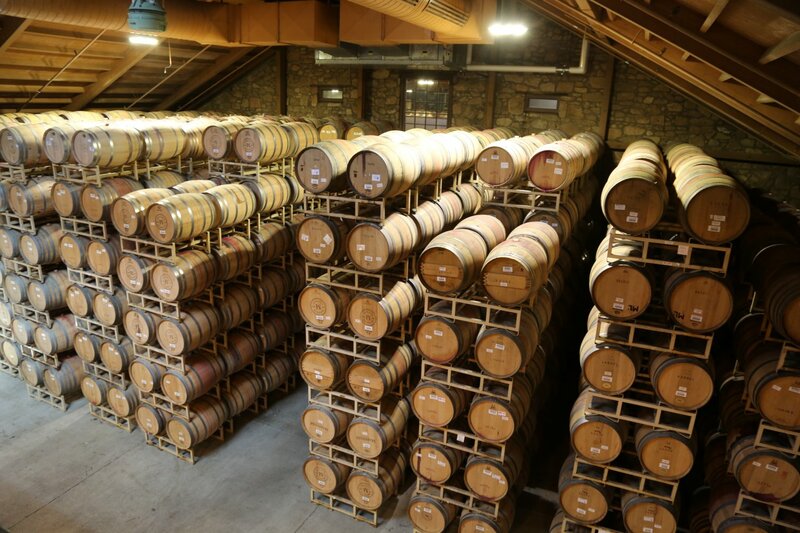 Wineries that are still producing wine in the Napa Valley founded in 1874 or before are the following: Charles Krug, David Fulton, Schramsberg, Edge Hill and El Molino – although none of these wineries mentioned here have produced every year since their inaugural vintage. And of course there are several other Napa wineries founded prior to 1874 who are no longer around or who have been incorporated into modern wineries under different names (La Perla being one with Spring Mountain Vineyards). Incidentally the St. Helena Star was also founded in 1874 – therefore there are some pretty tidy records about Laurent Winery winery dating back some 140+ years. Laurent died in 1890 and the winery then had a succession of various owners. 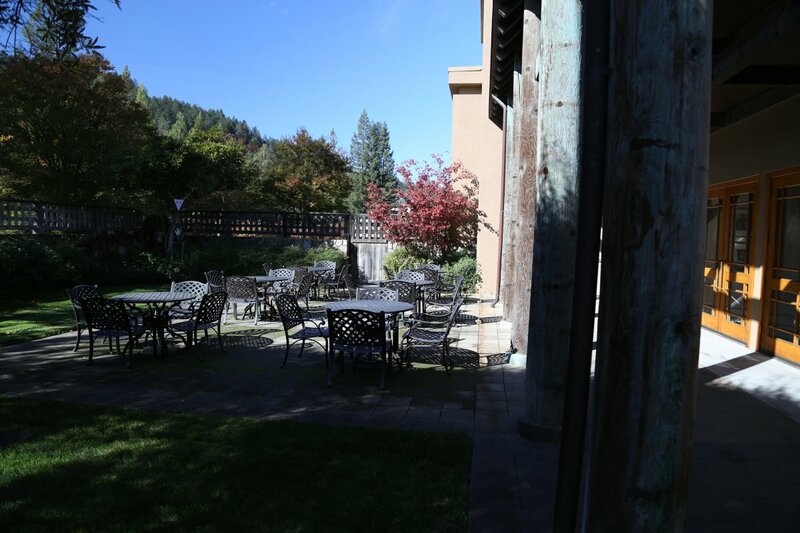 At one point in the late 1930’s the winery was site of the St. Helena Cooperative Winery (referred to as the little co-op” at the time). Decades later Bruce Markham for who the winery is named after came to the Napa Valley interested in owning vineyards and a winery. Bruce worked in his family’s advertising business helping expand their outdoor billboards to a number of states. Bruce sold his company in 1976 to the United States Government (as part of the Highway Beautification Act established during President Lyndon Johnson’s term – with the intent to clean up billboard clutter along highways). Bruce then moved to the Napa Valley where he soon purchased several hundred acres of grapes and sold the fruit to select wineries at the time including Robert Mondavi and Beaulieu Vineyards. Next he purchased the old Laurent Winery in 1977 which was under ownership of United Vintners (Heublein) at the time. He renamed the winery to Markham and released his first wine in 1978, a Cabernet Sauvignon. Interestingly enough, noted winemaker Robert Foley was his first winemaker. After 10 years, Bruce was ready for his second retirement, his ‘real’ retirement if you will, and by the late 1980’s decided to sell the business. 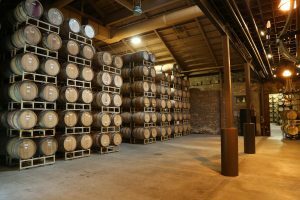 The buyer, Mercian Corporation, a prominent Japanese wine and spirits company with deep vineyard roots in Japan traces their history back to 1874 when two individuals were sent to France to learn as much as possible about viticulture and wine making. 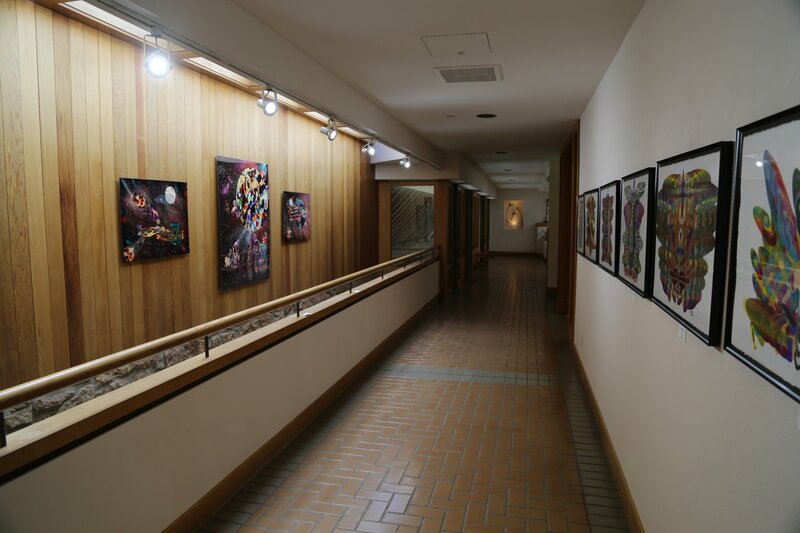 They spent two years in France, returned to the Katsunuma Valley and founded the Dainihon Yamanashi Winery in 1877 in the Yamanashi Prefecture (about 90 minutes on a good traffic day west of Tokyo). In 1949 the Mercian label was launched and was the first Japanese wine made entirely from Japanese grapes (incidentally the prominent native grape in this part of Japan is the white varietal, Koshu). The winery today is known as Chateau Mercian. Mercian also owns Chateau Reysson in Bordeaux. 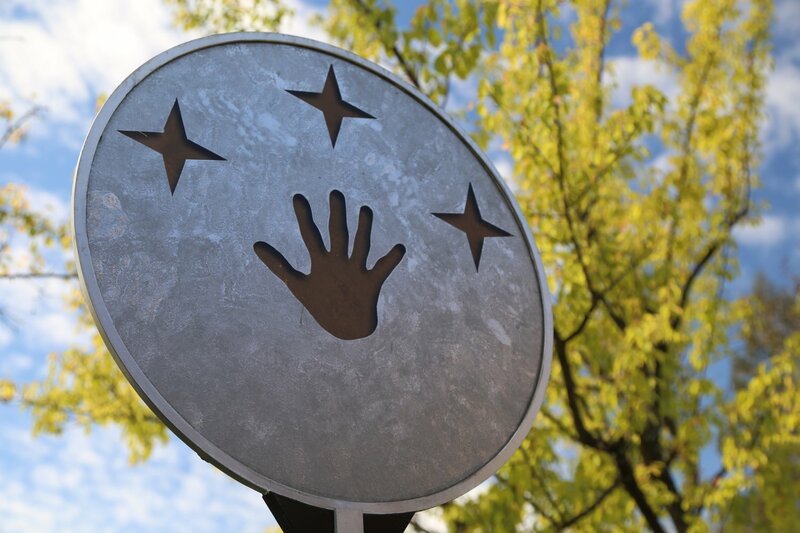 Today Mercian is owned by the Kirin Company (known for their beer). 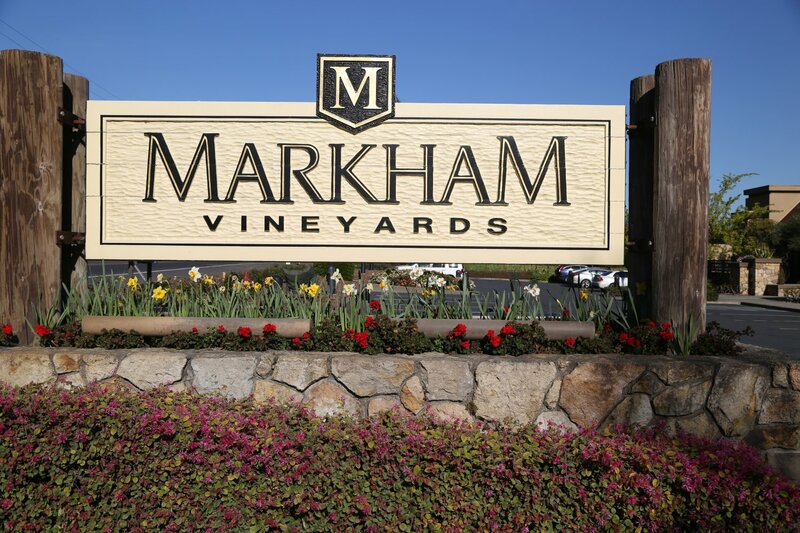 Mercian purchased Markham from Bruce in 1987, in 2017 celebrated 30 years of ownership, and two years later in 2019 internally sold the winery to Distinguished Vineyards (their parent company is Kirin). 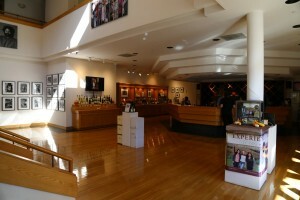 Distinguished Vineyards also owns several other wineries or brands including Napa based TEXTBOOK. 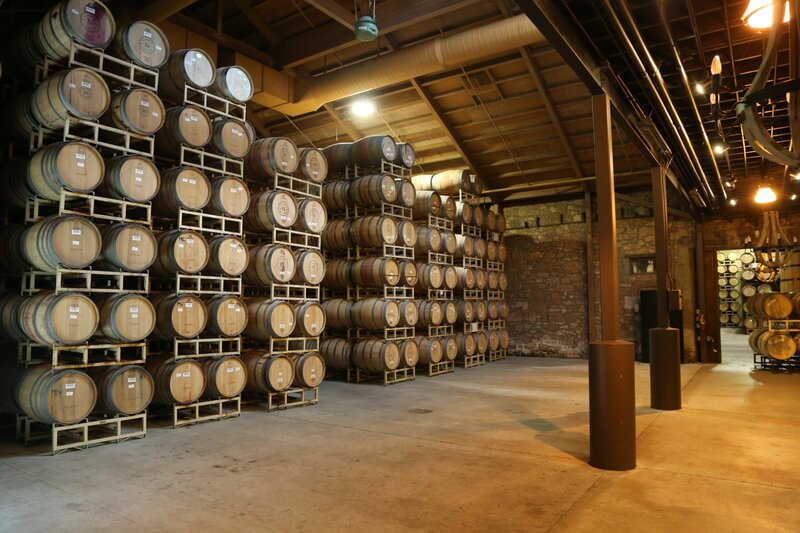 Upon first glance, visitors to the winery may not be aware of the size of their production facility. 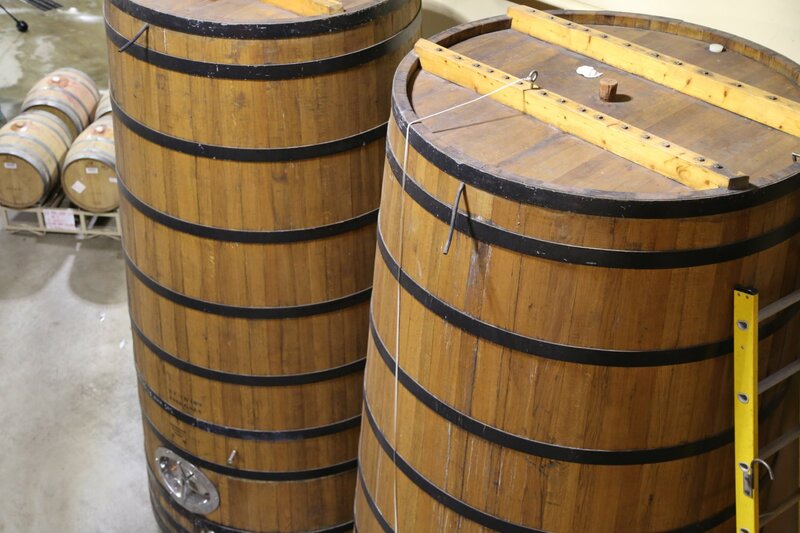 In 1988 Mercian invested heavily in renovating and expanding the winery footprint. Today their production runs between 100,000 and 120,000 cases depending on the year. 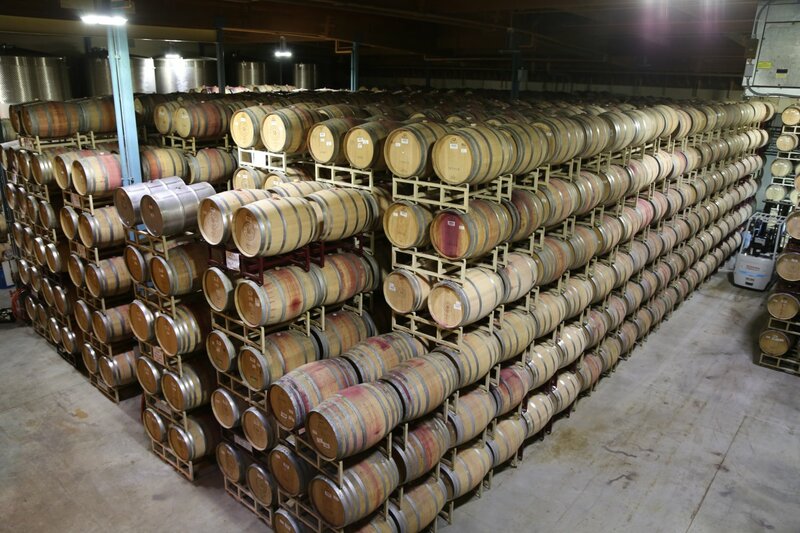 All production takes place on site with several impressive barrel rooms, a separate room for production of Chardonnay, a crush pad and their own bottling line. 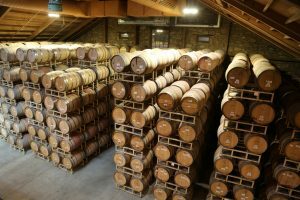 Markham uses both French, American and Hungarian oak barrels. While a fairly sizable winery for Napa standards, its location is north of the busy “wine strip” between Yountville and St. Helena, and therefore this part of the valley often doesn’t see as many visitors as further to the south. 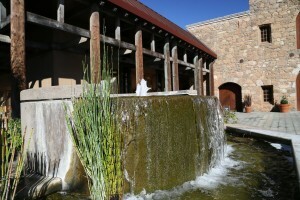 Guests enter through an impressive stone walled courtyard, past the koi ponds. The courtyard is a great place for taking photographs. 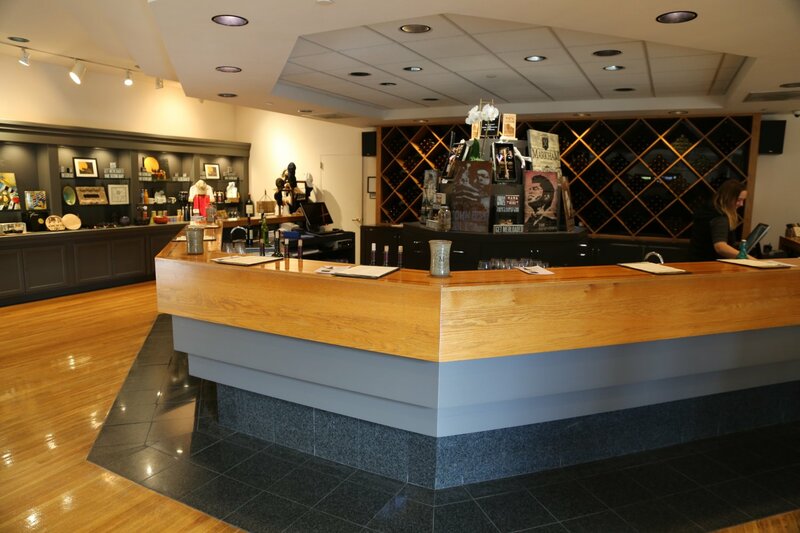 The visitor center and tasting room is located just inside the large wooden door on the left. Along with the tasting bar, a highlight of a visit here is their art gallery. 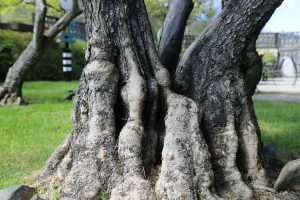 They always feature the works of one resident artist – during our latest visit it was art created by the husband-wife team of Harold and Peggy Francis (including some interesting pieces that take years to create where tree branches are directed to grow through metal implements (such as pick axes) and then chopped off and placed in an artistic arrangement. Popup art exhibits are also shown in the gallery – rotating 4x a year. 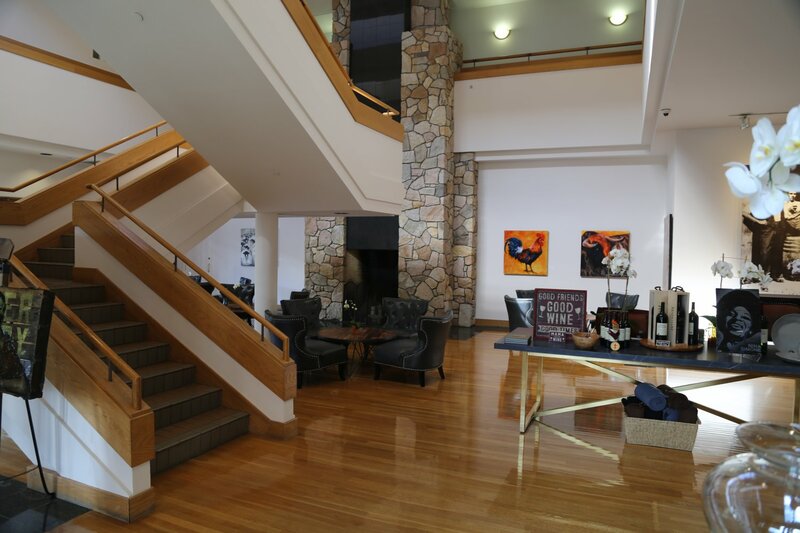 Guests can choose from several tastings including the Heritage Tasting (featuring wines that are nationally distributed) or the Estate Tasting focusing on wines that are only available at the winery or are produced from single vineyards. Guests do not need an appointment for these tastings. If you would like a more intimate experience – make a reservation for a private tasting in either their “Map Room” or “Heritage Room”. Currently Markham owns 350 acres of vineyards ranging from Calistoga, St. Helena and Yountville to Oak Knoll in the south. The soils types are often remarkably different between their vineyards – easily seen in the jars of soil located in their Heritage Room upstairs. 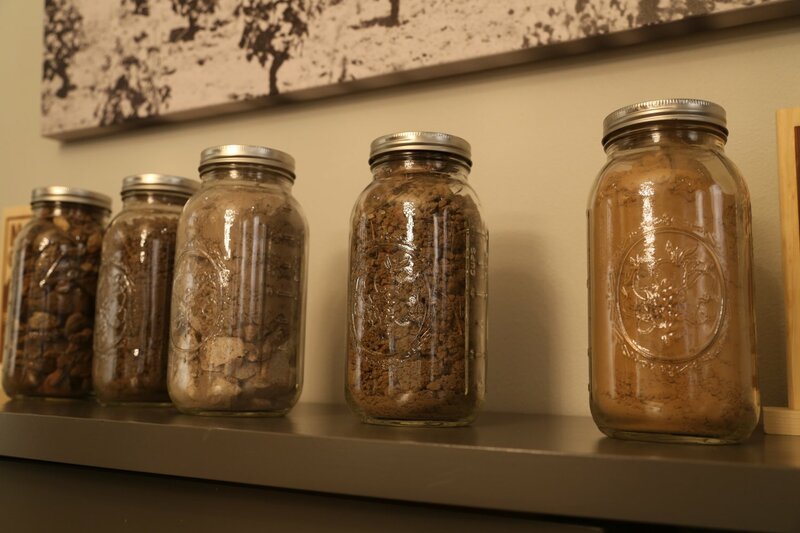 All grapes used for their wines are 100% Napa fruit with nearly all from their own vineyards – with some sourced fruit. And it helps they have owned their vineyards for decades; across the board their wines reflect an extremely impressive quality to price ratio. The 2016 Pinot Noir is from one of their Oak Knoll Vineyards; it is dark ruby color in the glass with aromas that show raspberry, white pepper, toasted oak and dried rose petal. On the palate it is a fairly robust Pinot Noir with good weight. Shows darker fruit with long lasting earthy tannins (that carry some grip). A lingering tartness (red cherry flavor) lasts for some time tinged with a kiss of mocha. 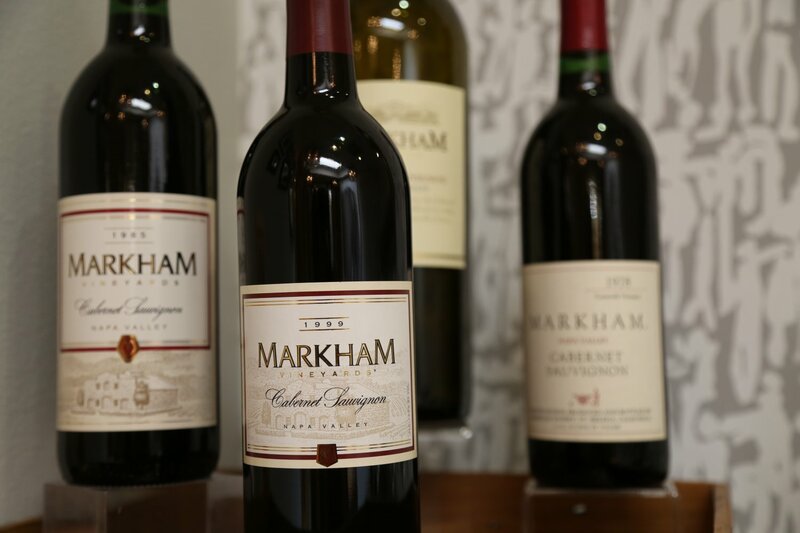 Despite not making Merlot for the first few vintages, Markham is most known for this varietal (first vintage 1980). Today Merlot is about 50% of their production. The primary outlet for these wines are restaurants especially at steakhouses nationwide. The 2014 Napa Valley Merlot is sourced in the southern part of the valley from their Yountville and Oak Knoll properties. Immediately shows sweet ripe aromatics – our first thought when writing notes for this wine was “think cherry pie coming out of the oven” – shows aromas of red cherry and raspberry tinged with cocoa powder. Very balanced, with mostly red fruit flavors on the palate with dry tannins that linger for some time along with a red berry tartness. Good food wine – easy drinking. The 2014 Syrah is from one of their Oak Knoll vineyards – immediately shows a gamy or meaty quality on the bouquet, with layered dark fruit aromas that open nicely given enough time to breathe. Some of the savory characteristics for the bouquet continue onto the palate. Shows flavors of spicy plum skin, black cherry along with hints of pepper and Asian spices. The tannin profile is pleasing, soft but noticeable along with being slightly chewy. 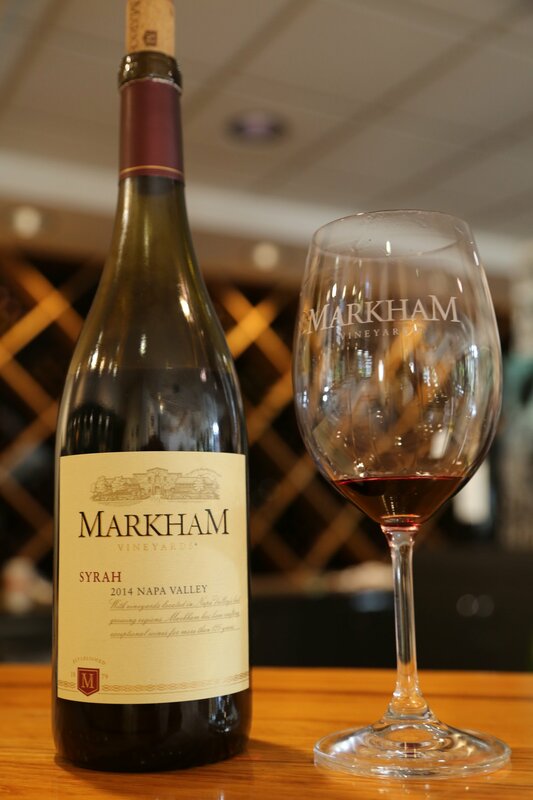 And Markham produces wines from several varietals that are extremely uncommon in the Napa Valley. 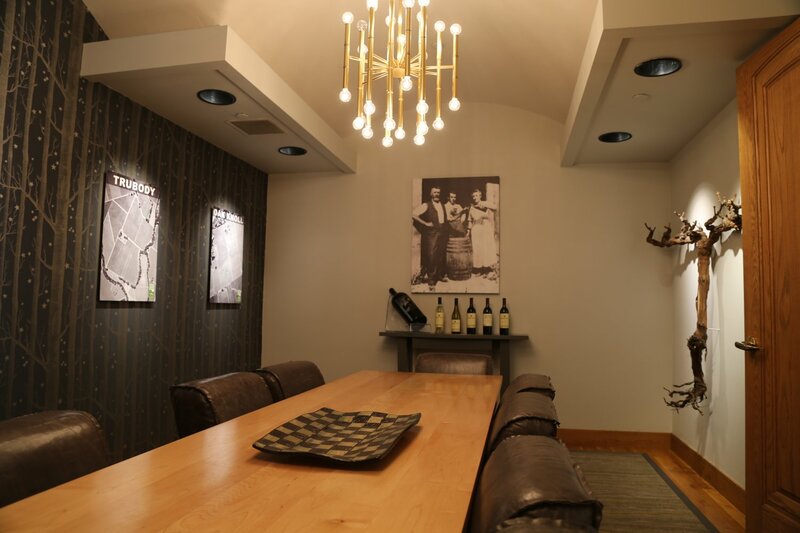 These are winery visit only accessible wines including Charbono, Muscat Blanc and Tannat (we are aware of only 1 other Napa based producer making a Napa grown Tannat (Caldwell Vineyards). Tannat is a varietal originally from parts of Southwest France but has become associated as the prominent varietal in Uruguay. The 2014 Tannat shows a sweet slightly closed bouquet with aromas of raspberry – where it shines is on the mouth feel. Soft on the palate and somewhat rounded this wine shows some slight weight without being heavy or tannic. Very balanced, with flavors of red cherry lingering through to a soft finish. 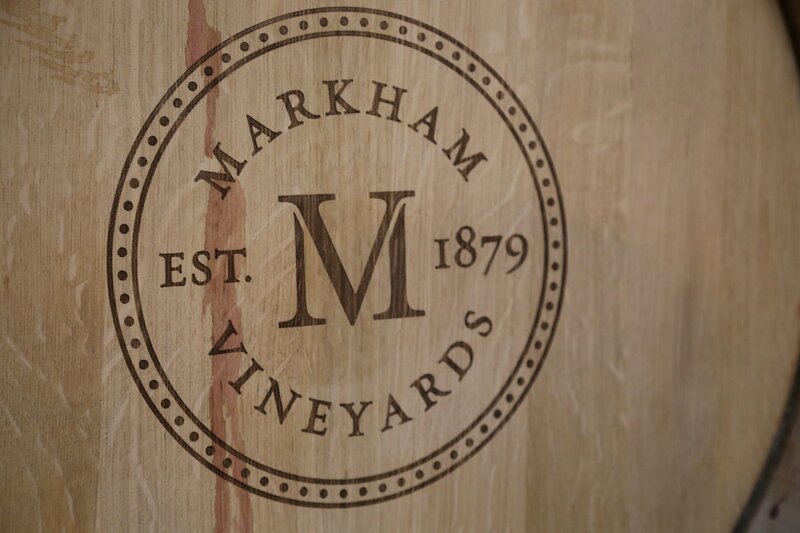 Winemaker, Kimberlee Nicholls, has been with Markham since 1992 and is very well respected in the industry. She has trained with several of Napa’s most well-known winemakers during her long career. However, her time at Markham is still much less then long time vintner Bryan Del Bondio. He was hired in 1978 as Markham’s first employee and has remained with the company since – celebrating his 40th anniversary with Markham in 2018 (extremely rare someone stays with a winery in the Napa Valley for this amount of time). 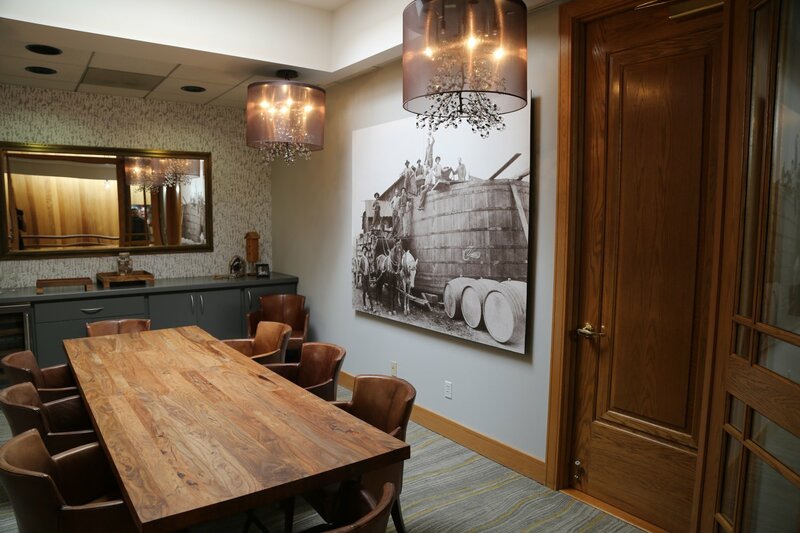 You know you have left your mark on a winery when a giant black and white photograph hangs near the tasting room of your ancestors. And as one of the winery employee told us with sincere respect in his voice, Bryan is referred to around here as the “winery mascot”. What is very nice is they often have older vintages available for tasting up to 7 and 8 years old listed as Last of Vintage on their tasting sheets, as well as even older wines than that for purchase (library wines) – although note that these older vintages are not advertised in their tasting room and availability will vary from vintage to vintage. Large format bottles are also available of select wines. 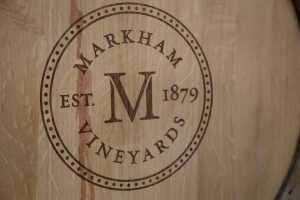 Markham produces several wines with some of the proceeds of sales going to various charities including for medical research and the Special Olympics. Two such wines are their limited production Cabernet Sauvignon focused, The Altruist and The Philanthropist. 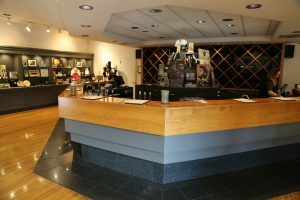 Markham has the space to host private winery events – including corporate events (sometimes large groups up to 200 people). 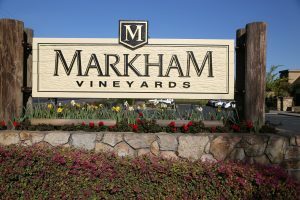 Markham seems like a very good winery to work for – during our visits the employees seem to enjoy their jobs – are always down to earth, personable, friendly and interested in sharing wine related information with visitors.